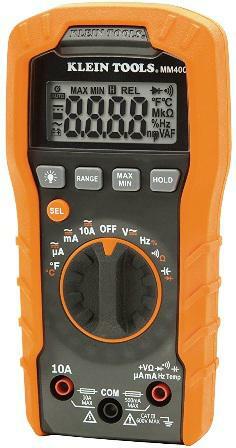 The MM400 by Klein Tools is a lower budget meter by this respected US multimeter manufacturer. An auto-ranging device, it has most functions and test ranges that the average user might need and incorporates the tough build quality that Klein is renowned for. Voltage is to 600V, amperage to 10A, and it can also do temperature, capacitance and frequency. Usage: Both residential and commercial, but it’s best not to push this beyond light industry. As with other Klein meters, the MM400 was designed by electricians. It is thus logical and easy to use. This is a meter for a variety of fields with a wide range of test criteria, to include capacitance and temperature. You don’t have very large spans – capacitance only going up to 200µF for instance – though voltage and current are both good. The Klein Tools MM400 is powered by cheaper, easier to get AAA batteries as opposed to more expensive 9-volters. The display is fairly standard (to 4000 count) and is sans bar graph, though is backlit. The lower current circuit is incorporated with the other test ranges, which isn’t ideal but compromises needed to be made to keep the price tag down. Continuity comes with a beeper and is fairly timely, and of course it is auto ranging. Temperature is displayed in either Fahrenheit or Celsius and comes via the standard method of input, through an included thermocouple. This simply plugs through the main terminal/common connection. Aside from the smaller capacitance and frequency ranges, there are mostly only positives with the Klein MM400. But at least you get these test ranges, which not all multimeters of this price include. You also won’t get a carry case included, but these are available separately at minimal cost. It is not as meaty as some of the other multimeters in the Klein MM range, such as the 600 or 700, but then again you pay a higher dollar amount for the privilege. For checking power in socket outlets, switches and batteries, etc, it is a great option. These figures are not necessarily the best accuracy per given test criteria, more a sample of what the signal test range might be. Klein tools are well built and this follows through to thir testers. The MM400 is a compact device with a rugged, rubber holster that is certified to 1m drops and can handle a fair amount of abuse at the jobsite. It is grippy and durable and has a tough, flip-out stand and rubber feet. The dial is meaty and yet easy to turn with one-handed operation. The buttons are large, simple and also rubbery. Batteries can be changed easily from a separate compartment. Lead wires are of the supple kind. Display: While not super-high resolution, the backlit display is clear and easy to read. Resolution is to 4000 counts, which is kind of standard at this price, tight enough to discern the kind of signals you’d be testing at the generic level. Frequency sampling is three times a second. You get a bit of lag with continuity – and capacitance in particular – but will always encounter this on meters under the $100 range. With that, linemen looking for speed would want something quicker and may want to stick with the higher rated Flukes. Button functions: Max/Min is one of the most useful test criteria you can have when wanting to see discrepancies in a given signal as it stores high/low values. Data hold is also available with the Klein Tools MM400, along with a Range button to switch to manual ranging. Other functions include an auto shut-off, which is often overlooked when buying meters but is a godsend for those inclined to leave things switched on after use. On time is around 15 minutes before it will shut itself down. There are two fuses on board; one for the high, 10A current circuit and the 500mA across the main terminal. The fuses are the ceramic HRC type; a sure sign of quality input protection. The category rating of the MM400 – which signifies strength and quality of the circuit board components – is CAT-III @ 600V. This gives it an over-voltage protection to 6kV. The review of the Klein Tools MM400 is good for those into standard electrical works – i.e. those that don’t need superior accuracy, speed or the ability to measure sensitive electronics. But is does everything else pretty well and comes with a strong case. If you need more oomph and wider test ranges, perhaps look to the Klein MM600 or MM700, both of which offer a higher category rating and some wider ranges. Alternatively, Amprobe’s AM-500 series has similar meters, like the AM-510, or Extech’s EX series on build quality.